Ridden by Shane Foley, who won the Irish 1,000 on Jet Setting in 2016, Romanised ran out an authoritative winner as he came from way off the pace. Mark Johnston’s British raider Elarqam – fourth in the 2000 Guineas at Newmarket – broke smartly and shared the pace with Aidan O’Brien’s US Navy Flag. The race looked wide open with several in with chances, including Charlie Appleby’s Symbolization, Gutstav Klimt and Threeandfourpence, but Romanised was produced with a sweeping run in the centre of the course to land the Group One spoils. US Navy Flag and Gustav Klimt were second and third for the O’Brien team, with the distances two and a quarter lengths and a length and a quarter. Condon – winning his first race this season and first since last summer – said: “We kept faith in him and he had excuses at Naas on his comeback. “He worked the best he’s worked all spring last Tuesday. We knew we were a long shot coming in here, but I felt he was going to run a big race. “He’s always shown talent and he just seems to have come to himself in the last few weeks. “I’m in a bit of shock and it will be a few days before it sinks in. It’s just amazing to win a classic. It’s all I wanted to do when I entered racing. “It’s a very select club and to actually step into that club feels like you are walking through special doors to be considered one of those. “I knew I was never going to be training a huge amount of winners, but we aimed to have a few nice horses through our hands. He went on: “I’m delighted for everyone involved, the lads in the yard, we’re only a small team. He’s a horse that we’ve always had quite a bit of faith in. “We just train 30 and we are lucky enough to have a few stakes performers among them. It’s nice to work with nice horses. “There are a lot of guys like me. The country is full of very good horsemen and very good riders and we’re all looking to get our hands on a good horse and show what you can do. “Thankfully he walked through our door and he showed us very early on that he was talented. “Talent is one thing, but you have to have the temperament and carry it forward. His temperament has improved and he was very relaxed today. “He was a little tricky to saddle, but once that was done he walked around very calmly. “He wasn’t probably the finished article at Ascot (last year), but I thought he ran well and looked like he was just staying. “He’s bred to want a trip, but he’s a horse that shows an awful lot of pace and I must admit I wasn’t quite sure If he’d get the mile. “I said if he relaxed early on he’d run a big race. Shane just said after a furlong he tried to take a run and get strong with him, but then he relaxed. Looking to future plans, Condon said: “He’s in the St James’s Palace and Commonwealth Cup (at Royal Ascot), we’ll see how he comes out of this. 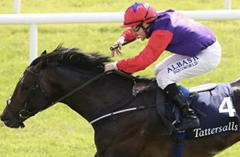 Foley said: “I was a bit disappointed with him last time in Naas, but he was just fresh and green. His run in the Solario last year, in behind Masar, was good enough and everything worked out today. The Irish 2,000 Guineas was first run in 1921, a year before the launch of the Irish 1,000 Guineas. The inaugural running was won by Soldennis. It is Ireland's equivalent of the 2,000 Guineas, and in recent years it has taken place three weeks after that race. The field usually includes horses which previously contested the English version, and seven have achieved victory in both events. The first was Right Tack in 1969, and the most recent was Henrythenavigator in 2008. The leading horses from the Irish 2,000 Guineas often go on to compete in the following month's St. James's Palace Stakes. The last to win both races was Canford Cliffs in 2010.